I realize we’re at the opposite point on the calendar from apple season, but I can’t help thinking of my favorite time of year amid this relentless rain. After all, the warmest time in Berkeley tends to be autumn: weeks that are refreshingly colored with sun and falling leaves after a foggy summer. I admit I’m spoiled — not only is Bay Area weather reputably mild; we also have access to local and organic apples all year long. So why not evoke the fall, with its golden glow and end-of-summer warmth, by baking my favorite apple cookies today? 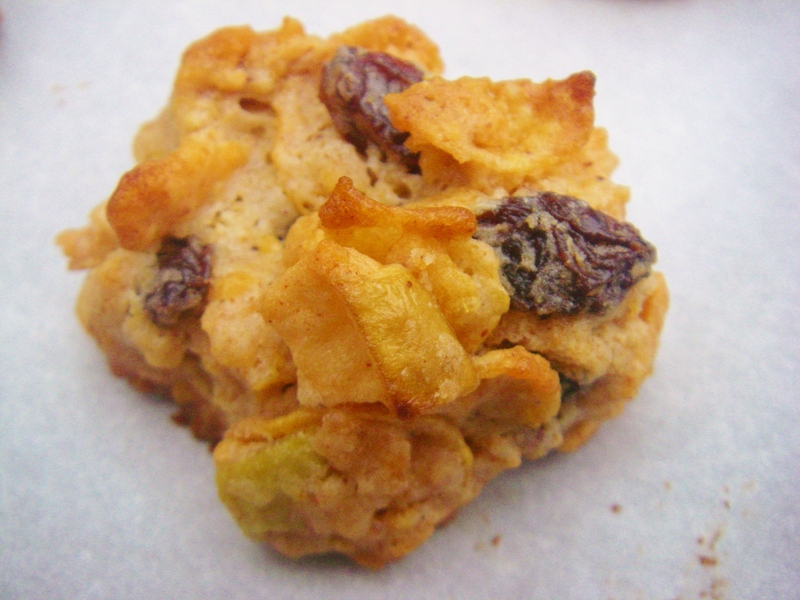 Full of juicy apples, plump raisins, warm spices, and crisp corn flakes, these cookies have a casual (if ugly) look. But don’t that that deceive you; they sparkle with amazing flavor and texture. various ground spices: cinnamon, nutmeg, ginger, cloves, etc. Wash, core and cut apples into cubes about 1/3” square. There should be a little over 2 cups (weighing 11-12 ounces) once chopped. 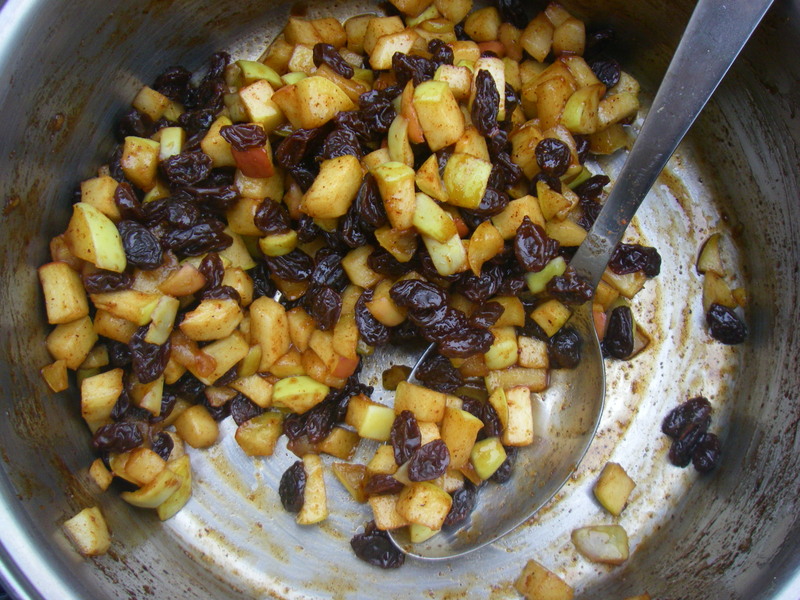 Place apples, raisins, and ¼ cup of the sugar in a saucepan over low/medium heat. Sprinkle liberally with spices. (I admit, I don’t measure. My general rule of thumb is that ginger and cloves can be potent, so use less of them and more cinnamon and nutmeg.) Cook, stirring occasionally, until apples soften a bit and the mixture becomes sticky with a visible syrup — about 8-10 minutes. Remove from heat and let cool to warm room temperature. While mixture cools, preheat oven to 375 F. Line 2-3 cookie sheets with parchment paper. Crush two cups of the corn flakes coarsely; there should be 1 cup once they are crushed. In a separate, large bowl, mix the butter and remaining half cup sugar until creamy and smooth. Add the egg, egg white, and vanilla and stir until even in consistency. Using a sieve or sifter over the butter mixture, add the flour, baking powder, salt (if using), and a few more dashes of spices. 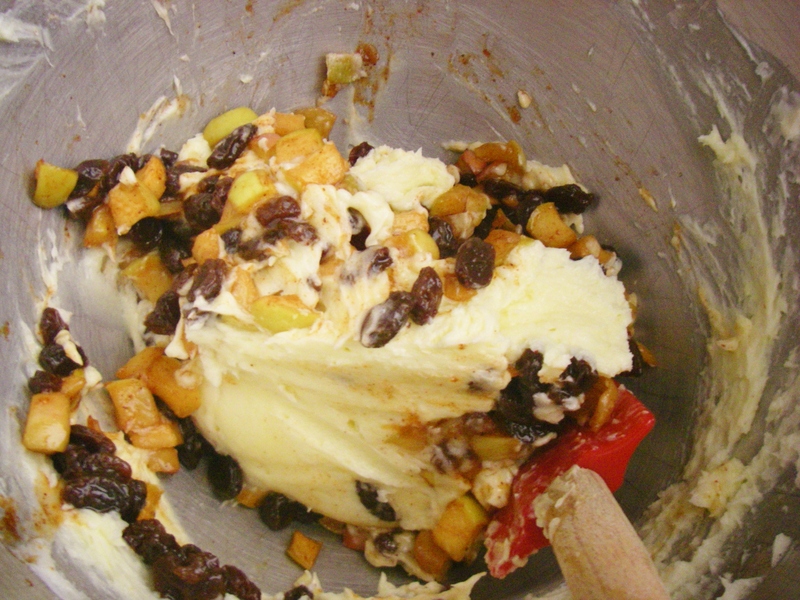 Alternate adding the crushed corn flakes and the cooked fruit to the batter by hand. Mix until just fully incorporated, then add the remaining 2 cups whole corn flakes, stirring them in gently until just combined. Scoop dough into cookies a little smaller than golf balls, weighing about .75 ounce each. Squeeze each one gently so it holds together while baking. Line them up on the lined cookie sheets with at least 1.5 inches between cookies, and bake for about 12 minutes. They’re done baking when the corners of the cornflakes are toasty and bottoms of cookies are nicely browned. Let the cookies cool on the cookie sheets for about 10 minutes before transferring them to a plate, container, or mouth. These cookies have the best texture the same day they’re baked (and are especially delicious when still slightly warm) but still have a great flavor the day after. While they’re baking, these wondrous apple cookies fill the house with a delicious, spicy aroma that foreshadows their incredible taste. Their bits of tender fruit offer a succulent contrast to their crisp bits of cornflakes and toasty edges. At once chewy, hearty and light, they just might remind you of the brilliantly varied seasons we get to experience on this incredible planet, no matter what the weather brings. 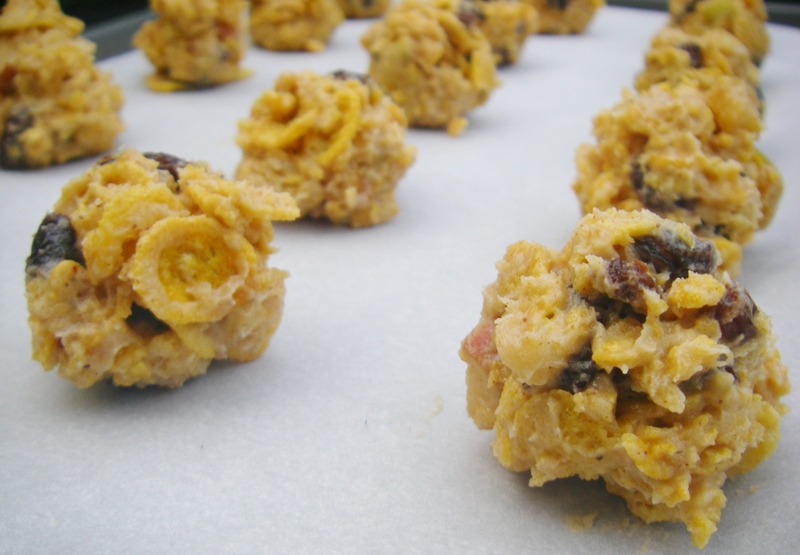 This entry was posted in Cookies & Bars, Sweets, Traditional with a Twist and tagged apple, apples, autumn, baking, cinnamon, clove, cloves, cookies, corn flakes, crispy, dessert, fall, gluten-free, nutmeg, raisin, raisins, seasons, snacks, spice, spicy, sweets, weather. Bookmark the permalink. Oh, I like that cornflakes are featured here (oddly, each time I’ve been in Russia, I’ve savored the breakfast cereal experience; Russian cornflakes are out of this world good); I’m sure they add a nice crunchy touch to the cookies! I’m sorry to hear the weather has been so frightful, but I’m glad that there are such things as apple cookies to provide comfort. Thanks, Katy! Now I’ve gotta try Russian corn flakes someday! (Who knew?) Yes, the cereal makes these cookies crispy and delicate; they’re especially yummy on the day they’re baked. Thank goodness for baking therapy on gray days!